The sequel to the entertaining “Duchess of the Shallows” manages to retain the charm of the first novel while expanding its world and the complexity of the story. It starts a few months after the first book with an initially unexciting plot by Duchess to try to get her new business partner admitted to the local weaver’s guild but from this simple beginning she quickly finds herself trying to carry out multiple overlapping schemes that take her to the very top of Rodaasi society. Her efforts to keep all of those plates spinning is entertaining and means the book feels much more fast-paced than the first book (which largely concentrated on a single heist). It does sometimes seem a little bit implausible when she embarks on a new scheme without waiting for the conclusion of her previous plots and on a couple of occasions it’s not entirely clear why she’s so determined to do some of the things (such as freeing the imprisoned Castor). A couple of the solutions to plotlines do seem a little bit too easy (such as when trying to retrieve a ring held as a gambling debt) but on the other hand some of the novel’s best moments come from some of Duchess’ schemes having unintended consequences. The ending is particularly strong, with Duchess belatedly realising how much others have been using her schemes for their own ends. For most of the first book Duchess only really had a single ally in the form of Lysander but the sequel does expand the cast with a number of interesting characters, some of whom are uncertain allies with ambiguous intentions towards Duchess. Her interactions with the amiable but devious head of the Keepers were particularly good, although her more straightforward friendship with Jana is a also a good contrast to the duplicity of most of her relationships. The world-building had been good in the first book and it is expanded greatly in the second book. The highlights of the world-building in this book mostly centre on the city’s three religious cults and on the ongoing mystery of the sinister catacombs beneath the city. Duchess’ confusion at being caught in the middle of a carefully choreographed religious ceremony is a particularly striking scene, and the contrasting religious orders of the Keepers and the Facets are both intriguing. The three religion’s shadowy battle for prominence becomes increasingly prominent as the book goes on and the fallout is likely to play a key role in future sequels. Duchess’ encounters with mysterious forces beneath the city feel slightly disconnected from the main plot of this book, but are probably going to be very significant for the series as a whole. One of the criticisms I had of the first book was that for much of the book it felt like the characters weren’t in much peril, but this part of the plotline (particularly a scene set in an underground crypt that injects a bit of horror into the story) manages to make it feel like the stakes are becoming much greater. Overall, this is an entertaining story with a set of interlocking and fast-moving plots, good characterisation and a few neat additions to typical fantasy world-building. 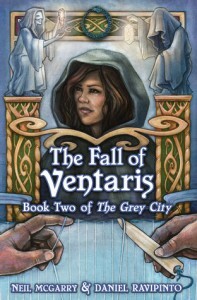 The Grey City is definitely turning out to be a good fantasy series.